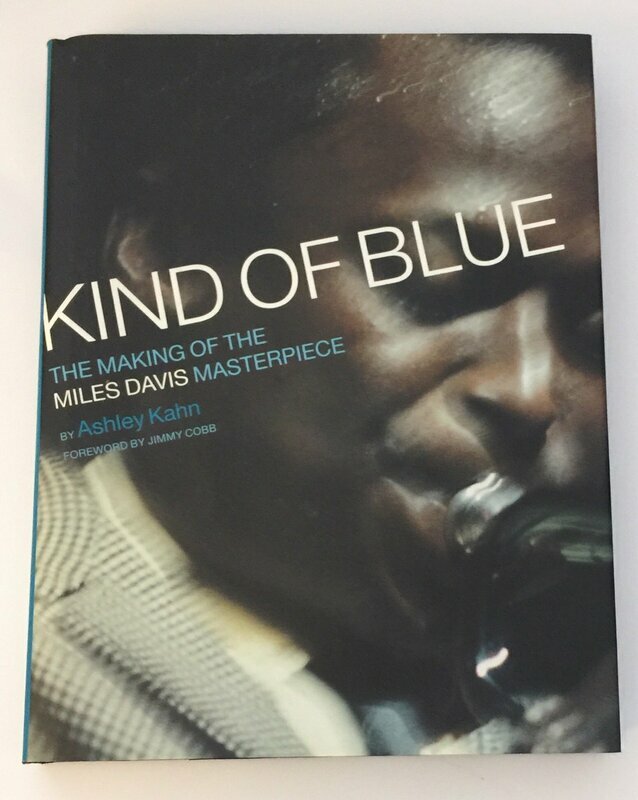 So begins the Introduction to Ashley Kahn’s remarkable narrative Kind of Blue: The Making of the Miles Davis Masterpiece as he recalls his excitement and anxiety on the day he was allowed to enter the former Columbia Recording Studios to listen to the original unedited session tapes of the landmark 1959 recording. On that day, Kahn would begin a process, carefully transcribing Davis’s spoken directions, along with the spontaneous dialog among the sextet’s members — Miles himself, John Coltrane, Julian Cannonball Adderley, Bill Evans, Wynton Kelly, Paul Chambers and Jimmy Cobb. In the weeks and months ahead, Kahn would go on to conduct over forty new interviews with musicians, producers, and critics, including Herbie Hancock, Elvin Jones, Quincy Troupe, George Avakian, Nat Hentoff and composer George Russell, whose Lydian Chromatic Concept of Tonal Organization helped shape Davis’s ideas about modal jazz, plus the only people still alive at that time who had witnessed the making of the album: drummer Jimmy Cobb, engineer Bob Waller, and photographer Don Hunstein. It is now sixty years since Kind of Blue was recorded in two impromptu sessions in a converted church that was the Columbia Recording Studios in Manhattan. It is not only the best-selling jazz album ever but one of the top-selling jazz albums every single year. By the unanimous decision of musicians, critics and fans, it is one of the most important recordings of the twentieth century. If there’s one album that every serious jazz listener should own — and probably does — it’s Kind of Blue. In Kind of Blue: the Making of the Miles Davis Masterpiece, Ashley Kahn takes us in his wayback machine to 1959 and into those New York studios to witness the making of this singular recording, this invaluable piece of recording history. With a “you are there” immediacy, we’re behind the scenes, in the middle of it all, getting to know as we never have before the individual personalities of the musicians as they emerge from the pages. We hear the false starts, the re-takes, the wisecracks. We see Miles’s charts, cryptic and personal, along with reproductions of Columbia’s original tape logs, Don Hunstein’s session photos, many of them previously unseen, and, intriguingly, Bill Evans’s original handwritten draft of his famous liner notes. And Kahn puts it all in the context of the jazz world and the society at large in the late ’50s, tracing Miles’s evolution from bebop to modal, commenting on the the racial undercurrents that were roiling the country, and on the work of John Coltrane and Ornette Coleman, who were taking jazz in new directions. Miles Davis: The Making of the Miles Davis Masterpiece is a meticulously researched chronicle. But it’s more than a book. It’s an adventure in time travel. ASHLEY KAHN is a journalist and editor who has contributed articles to the New York Times, Rolling Stone, Mojo, and other publications. He served as primary editor of Rolling Stone: The Seventies and primary contributor to Rolling Stone Jazz & Blues Album. He is the author of A Love Supreme: The Story of John Coltrane's Signature Album.